The BTC Company supporting the placement of a monument to mark the centenary of the end of the Isonzo Front • BTC d.d. In Cerje, just above the town of Miren, a monument – a sort of mausoleum in remembrance of the war from a hundred years ago – was completed in 2013. The interior of this monument has yet to be endowed with a rightful interior memorial dedicated to the defenders. 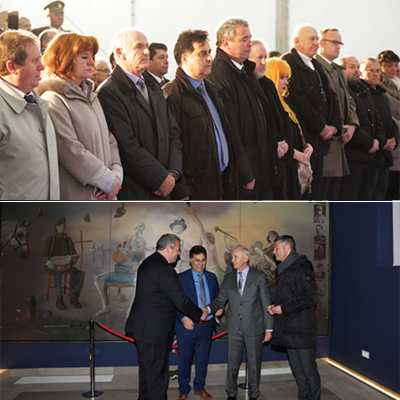 At the invitation of the President of the National Council of the Republic of Slovenia, Mr Mitja Brvar, and the mayor of the municipality of Miren-Kostanjevica, Mr Mavricij Humar, the BTC Company has become the main sponsor of the site and thereby enabled the placement of a large artwork in this area – an oil painting by a renowned painter Rudi Španzel, MFA. The monument itself, the artwork, as well as the amazing location of the monument – Cerje – have now truly become glorious. The grand event taking place on Saturday was attended by Mr Jože Mermal, President of the BTC Company Management Board, and Mrs Helena Petrin, Board member and Secretary General at the BTC Company.